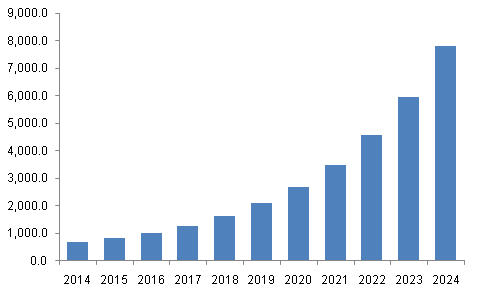 Software Defined Storage Market To Reflect Impressive Growth Rate By 2024: Grand View Research, Inc.
San Francisco, United States, 2018-Oct-11 — /EPR Network/ —The software defined storage (SDS) market size is expected to reach USD 17,461.9 million by 2024, according to a new study conducted by Grand View Research, Inc. The emergence of the Big Data technology is anticipated to impel growth in the global software defined storage market. Technological propagation, coupled with benefits such as high flexibility and cloud storage, is instrumental in keeping the industry prospects upbeat. The technology facilitates the efficient management and control of complex networks through proficient resource data traffic management. The advancements in the cloud technology, its availability, and wider access to cloud-based platforms are favorably impacting the industry. Various enterprises across the globe are experiencing the need for minimizing infrastructure development and data storage center costs which are significantly contributing toward theexpansion of the industry. Enterprises across diverse verticals are generating excessive data, creating the need for effective data storage management solutions. SDS solutions offer high agility and robustness to businesses along with cost and time efficiency. The industry is projected witness significant growth in the developing markets of South America and the Asia Pacific regions, owing to thestrong growth of the small-scale industries. The need for improving the efficiency and business processesin data centers is driving the demand for SDS solutions in small and medium-sized enterprises. The BFSI segment dominated the global software defined storage industry, accounting for over 17% of the market share in 2015. The large-scale data generation in the banking and financial institutions and the need for incessant data availability are leading to the large-scale adoption of SDS solutions in the BFSI sector. The North American regional market accounted for over 40% of the global revenue share in 2015. The strong presence of software defined storage solution vendors in the region is expected to contribute to the industry growth in the region. Asia Pacific is expected to emerge as the fastest-growing regional market. The rise of small-scale industries in the developing markets of India and China is driving the regional growth. Small and medium-sized enterprises accounted for over 30% of the global revenue share in 2015. The growth of Small and Medium-Sized Business (SMB) units across the globe, owing to the favorable government initiatives, is substantially driving the demand for SDS solutions among the small and medium-sized enterprises. The major vendors include Brain Corporation (U.S.), Hewlett-Packard (U.S.), HRL Laboratories, LLC (U.S.), Intel Corporation (U.S.), Numenta, Inc. (U.S.), and Vicarious FPC, Inc. (U.S.). Industry vendors are emphasizing on new product developments and forming technology alliances to gain a competitive edge in the industry.